Whilst Nintendo President and CEO Satoru Iwata’s GDC ’11 presentation provided the first glimpse at the new Super Mario title for Nintendo 3DS, what remained uncertain was the estimated window in which it released. 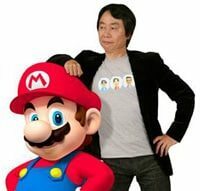 However, legendary game designer Shigeru Miyamoto has commented in a recent interview with French website Gamesblog.fr “I promise to do all I can to deliver the new Mario game this year,” teasing that the title is far enough along in development that a 2011 release may be possible. Little is known about what the game will entail, with Iwata presenting four screenshots briefly during his presentation last month, but we do know that it is being developed by Nintendo’s EAD Tokyo outpost who were responsible for the criticially acclaimed Super Mario Galaxy titles, and that a full reveal is expected at E3 in June.